contains a Christmas countdown of 24 tracks (with a bonus track for the day itself), featuring wonderful performances of some of the best-loved carols of all time. 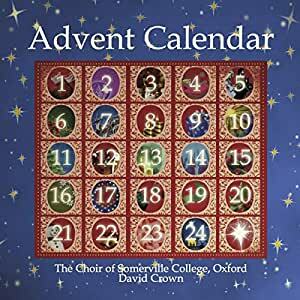 Stream Advent Calendar: The Choir of Somerville College by The Choir of Somerville College, Oxford and tens of millions of other songs on all your devices with Amazon Music Unlimited. Exclusive discount for Prime members. No doubt about it, the cover alone of this CD holds the promise of something special - sparkling wee gems to entice and draw the listener through a favourite time of the year. No MP3 version (yet! next time please) so, as I could not have a preview listen to samples first, I pretty much bought this album on the anticipation of this promise. I was not disappointed. This young and vibrant choir produces a mature and sumptuous sound under the direction of MD, David Crown, and takes the listener on a winding tour across the ages and around the world, weaving together the best of everything - 4 exquisite Bach chorales (to mark the Sundays), mixing effortlessly with traditional favourites (including a melt-in-the-mouth Bleak Mid-Winter) and other beauties such as Bethlehem Down and Veiled In Darkness. Professional soloists, Mary-Louise Aitken and Jeremy Carpenter bring textures and timbres that sparkle and float and beguile all at once, layering the depths of this album with further riches. Fabulous. If you buy just one album this Christmas let it be this. Mine is already well played and will be filed into Christmas Favourites for years to come. ps the notes are interesting and well worth the read too.